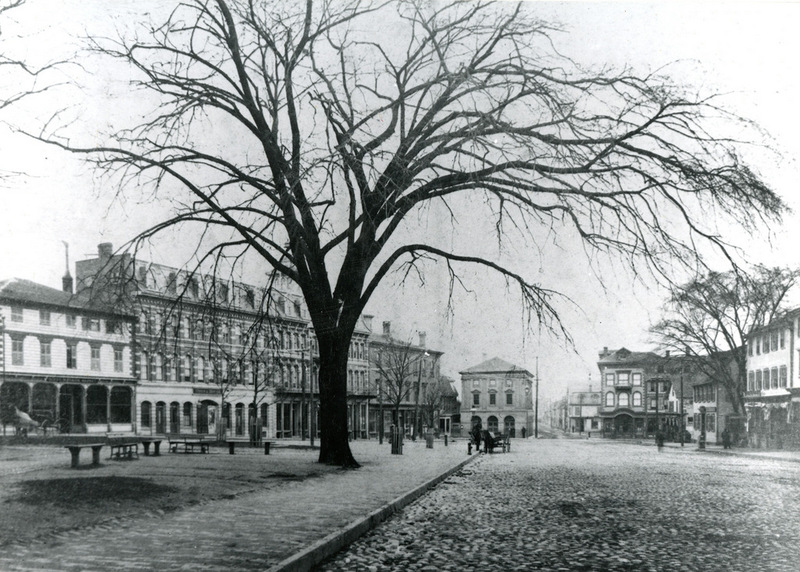 Facing west along the north side of Washington Square in Newport, around 1880. Image courtesy of the Providence Public Library. Washington Square has been the main focal point of Newport since its establishment in 1639, when the first settlers built their homes in this area. Over the years, it was variously known as the Mall and the Parade, and by the mid-18th century it was the civic and commercial center of Newport, with the Colony House and the Brick Market located on opposite ends of the square. In a sense, this arrangement was somewhat unusual for New England towns, which typically had a church, as opposed to secular buildings, situated in the most prominent location on the town common. However, here in Newport this reflected colonial Rhode Island’s focus on religious liberty, by not showing preference to one particular church over another. 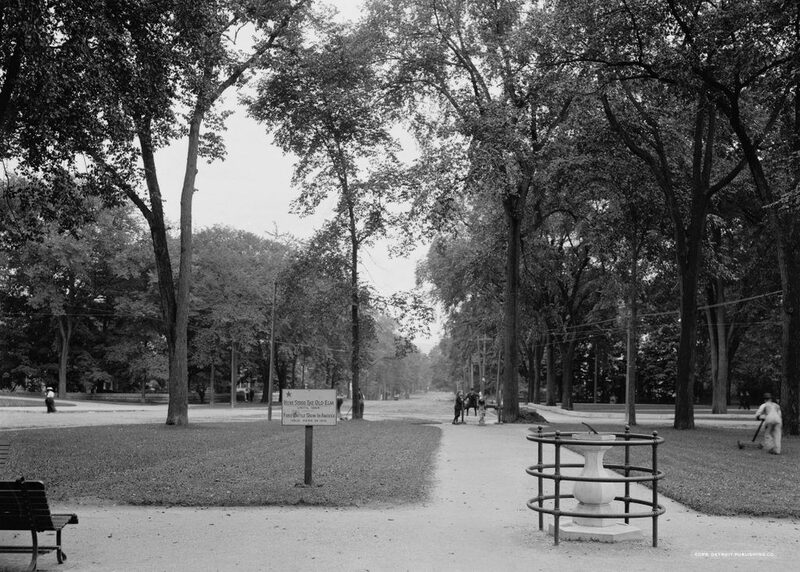 Around the turn of the 19th century, the area came to be known as Washington Square, and over the next few decades the park was landscaped with trees, fences, walking paths, and a fountain. During this time, the square was the site of many fine mansions, including the one that is seen on the far left side of the photo. Built around 1750 for Peter Buliod, this house was purchased in 1818 by Oliver Hazard Perry, a Rhode Island native who achieved prominence as a naval hero in the War of 1812. He died a year later while serving in the Caribbean, but the house remained in his family until 1865, only about 15 years before the first photo was taken. By the time the first photo was taken around 1880, modern commercial buildings had come to dominate the square, although some of the old mansions were still standing. Perry’s former house had become a commercial property, with a storefront on the first floor, and on the other side of the photo, further in the distance, was the Rathbun-Gardner-Rivera House, which had been built around 1722 and converted into a bank in 1803. In the center of the photo, the colonial-era Brick Market was still standing, although by this point it had become Newport’s city hall. Directly behind the photographer, the old Colony House was also still standing, and it was still in use as one of Rhode Island’s two state houses, with the state legislature alternating sessions between here and Providence. Nearly 140 years after the first photo was taken, Washington Square has not undergone any significant changes. Some of the 19th century buildings have come and gone, but overall the area has retained the same scale, with mostly two and three-story commercial buildings surrounding the square. It is hard to tell because of the trees, but most of the buildings on the left side of the scene are still there today. On the far left, the Buliod-Perry House is still there, and was restored to its original appearance in the mid-1970s. Next to it is the Henry Bull Opera House, which was built in 1867 and still stands, although it no longer has its top floor. The Perry House Hotel to the right of it was demolished in the 20th century and replaced with a two-story commercial building, and at the corner of Thames Street the 1861 Henry B. Young Building still stands, although heavily altered and without its top floor. The 1760s Brick Market is still standing at the western end of Washington Square, and it is now a National Historic Landmark that serves as the Museum of Newport History. 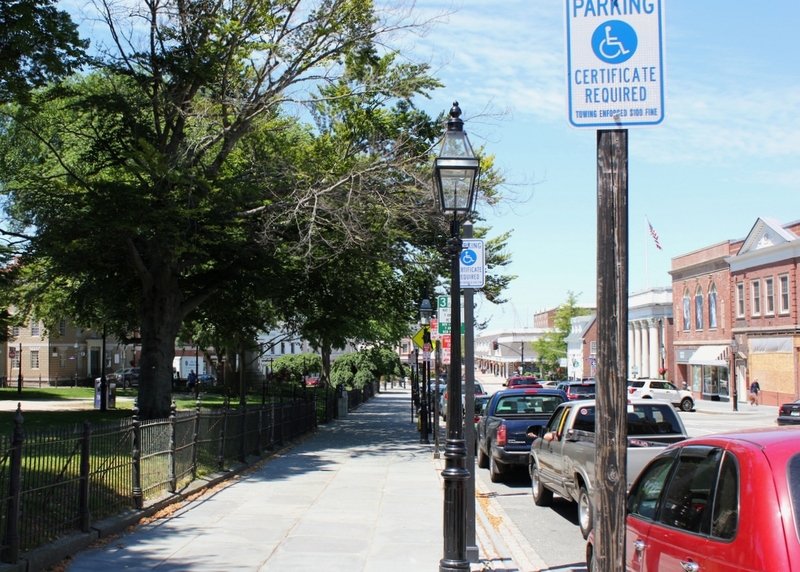 Further to the right, the Rathbun-Gardner-Rivera House is still there, partially visible just to the left of the handicapped parking signpost. It is still a bank, having been used as such for over 200 years, but otherwise the right side of the scene is not as well-preserved as the left side. All of the other buildings here on the north side of Washington Square are from the first half of the 20th century, and the ones in this scene date back to around 1929-1931. However, directly behind the spot where this photo was taken, the Colony House is still standing as another one of Newport’s many National Historic Landmarks. 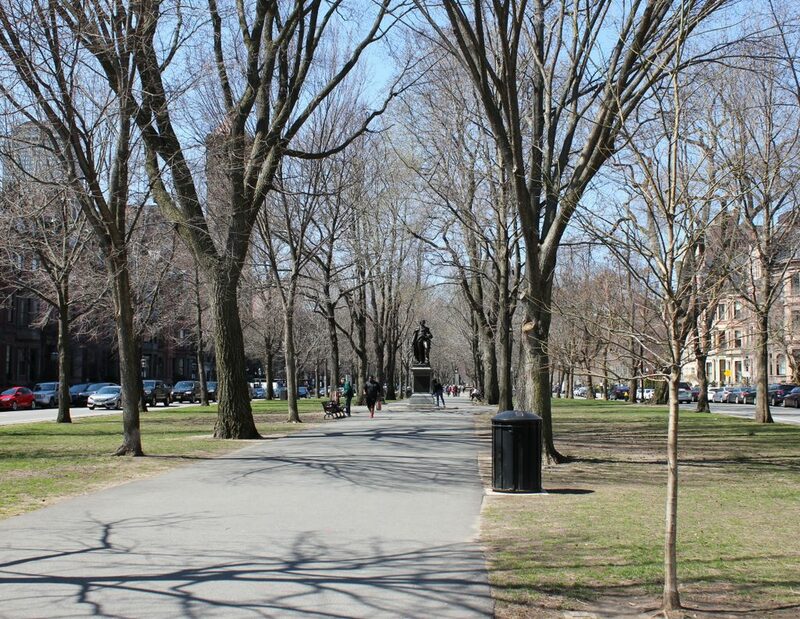 As for the park at the center of Washington Square, it is not much different from when the first photo was taken. The only significant change came in 1885, when a statue was dedicated to Oliver Hazard Perry to celebrate the 100th anniversary of his birth. Located directly opposite his house, it is mostly hidden by trees but still stands on the square. The park itself was renamed Eisenhower Park in 1960, joining Washington and Perry as another military hero whose name would be associated with the square. Eisenhower spent several summers here in Newport during his presidency, and he was present here at the park for the dedication ceremonies in the summer of 1960, during his last year in office. 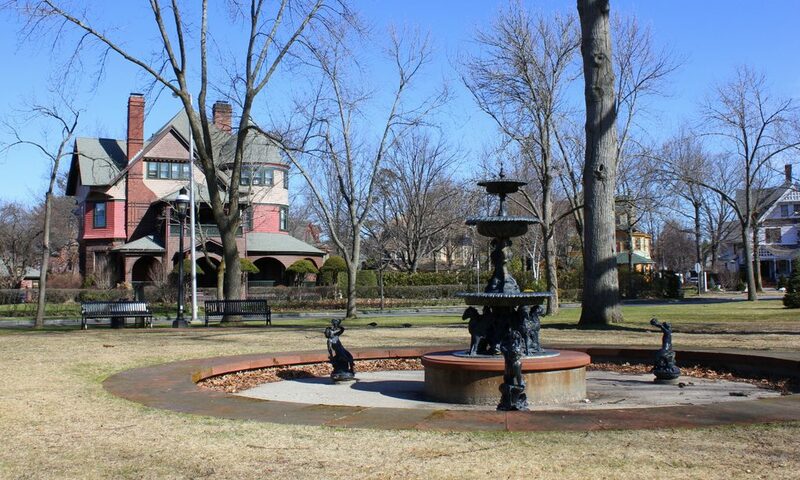 A few years later, in 1968, the park would join the rest of the neighborhood as a contributing property in the Newport Historic District, which is collectively another one of the city’s National Historic Landmarks. 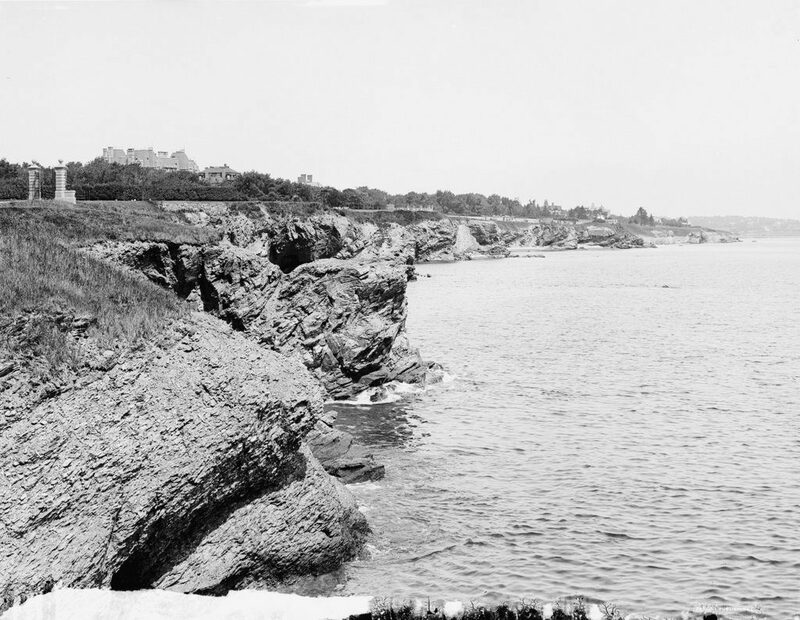 Looking north on the Cliff Walk from Ochre Point at The Breakers in Newport, around 1900-1906. Image courtesy of the Library of Congress, Detroit Publishing Company Collection. One of Newport’s most popular attractions is the 3.5-mile Cliff Walk, a trail that runs along the rocky cliffs on the southeastern side of Newport. It is famous for both the scenic beauty of the Atlantic coastline, as well as the architectural grandeur of the Gilded Age mansions on the opposite side, but its origins were far more practical than recreational. 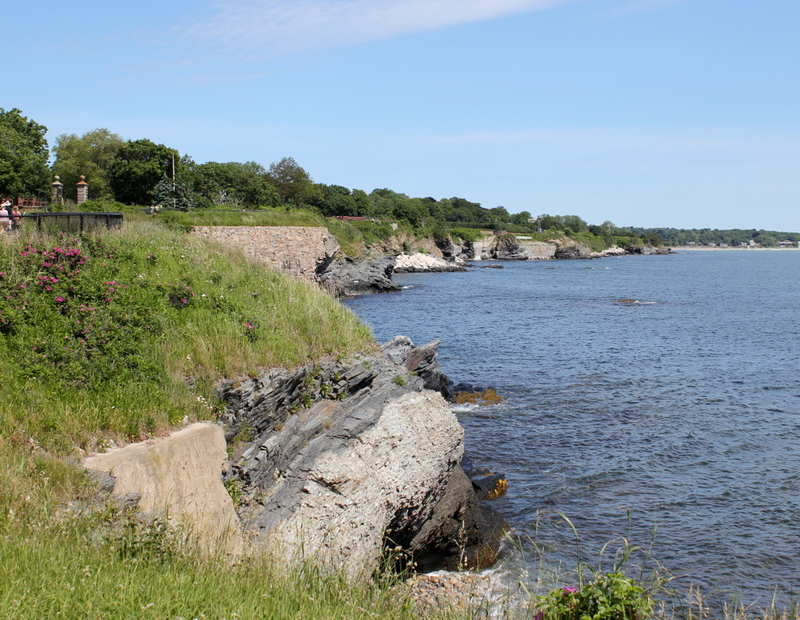 Much to the chagrin of millionaire property owners who would come several centuries later, the legal concept behind the Cliff Walk came in 1663, when King Charles II granted Rhode Island a charter that, among other rights, allowed all colonists to fish along the shoreline. This doctrine of publicly-accessible shores was later enshrined in the state constitution, and is still in effect today. In the early years of Newport’s history, this right was of little significance here on the sparsely-settled southeastern shore, and there was not much to prevent people from walking along the cliffs if they felt so inclined. However, by the mid-19th century Newport was becoming a popular summer resort, and the right of people to walk along the cliffs soon came into conflict with the privacy and the property rights of the millionaires who built their summer homes here along the coast. As a result, many of the landowners built fences or hedges for privacy, making many of the mansions completely invisible from the trail. The first photo was taken from the easternmost part of the trail, at Ochre Point behind The Breakers, the famous home of Cornelius Vanderbilt II. The gates in the distance on the left mark where the trail leaves the Vanderbilt property, and beyond the gates is the roof of Ochre Court, the home of prominent real estate developer Ogden Goelet. Like The Breakers, this house was designed by architect Richard Morris Hunt, and was the largest in Newport when it was completed in 1892, although it would soon be surpassed by The Breakers itself, which was completed in 1895. However, by the time the first photo was taken only about a decade later, both Vanderbilt and Goelet were dead, although the houses would remain in their families until well into the 20th century. Today, more than a century after the first photo was taken, this landscape has remained remarkably unchanged. Although not visible in the 2017 photograph, both The Breakers and Ochre Court are still standing, as are many of the other Gilded Age mansions along the Cliff Walk. However, most of these are no longer privately owned, thanks to changing tastes and the incredible upkeep costs of these houses. What had been an extravagant symbols of wealth in the late 19th century had become expensive white elephants by the mid-20th century, and today The Breakers is a museum while Ochre Court is the administration building for Salve Regina University. 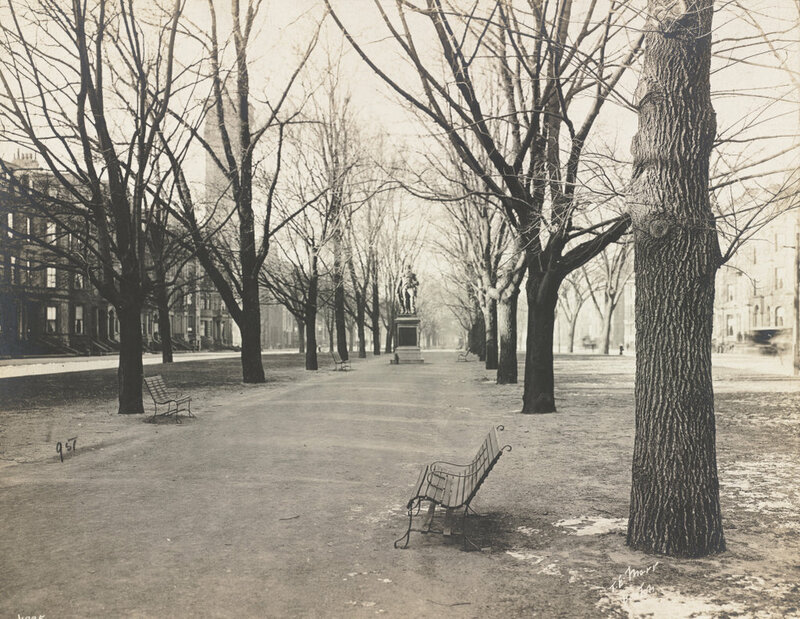 Facing west on the Commonwealth Avenue Mall from Berkeley Street, on November 27, 1901. Image courtesy of the Boston Public Library. When the Back Bay was planned in the mid-19th century, the streets were laid out in a rectangular grid pattern, with five east-west streets running the length of the development. In the middle was Commonwealth Avenue, which was made significantly wider than the others in order to accommodate a wide, tree-lined mall in the center. The house lots on this street soon became some of the most desirable in the Back Bay, and as the trees matured the street began to take on the appearance of a Parisian boulevard. Most of the houses along this section of Commonwealth Avenue, which extends west from Berkeley to Clarendon Streets, were built in the 1860s and 1870s, in the Second Empire style of architecture that was popular during this period. Among the street’s few non-residential buildings is the First Baptist Church, which was built in 1875 and can be seen a block away on the left. The streetscape of Commonwealth Avenue also features a number of statues, including the one in the center of the photo that honors Revolutionary War hero General John Glover. 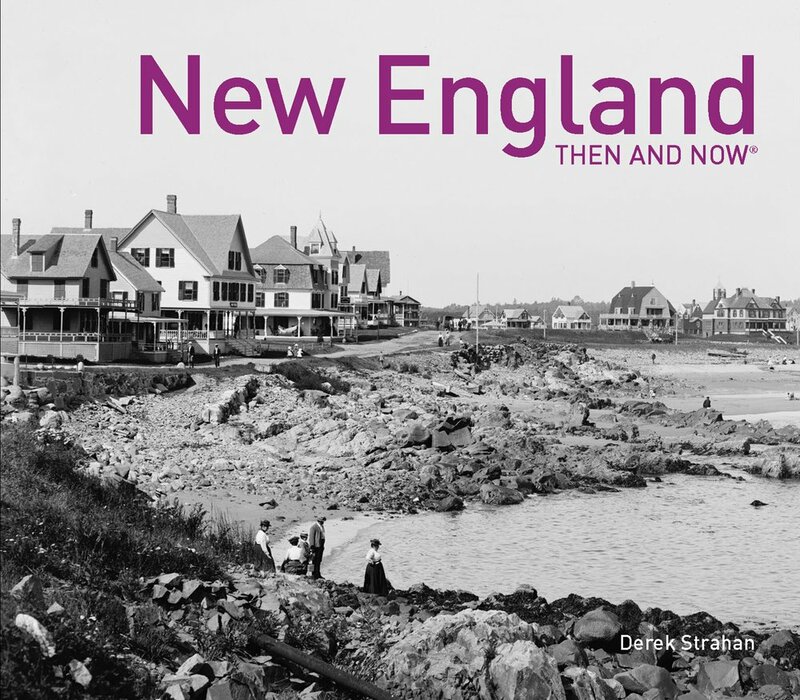 More than a century after the first photo was taken, the Back Bay has remained remarkably unchanged. Nearly all of the historic Victorian brownstone homes are still standing, and Commonwealth Avenue has continued to be the centerpiece of one of the city’s most desirable neighborhoods. Aside from the cars on the street, the only hint of the modern world in the present-day scene is the Prudential Tower, which is barely visible through the trees on the far left side of the photo. Facing north toward Worthington Street from the center of the Thompson Triangle, around 1892. Image from Picturesque Hampden (1892). When the first photo was taken, the house in the distance was the home of William McKnight, and it is described in more detail the previous post. John and William McKnight were the developers of most of this neighborhood, and they created a highly-desirable residential area for many of the city’s wealthiest residents. Part of their development plan included several triangular parks, which they donated to the city. Although ostensibly an act of generosity to the public, these parks also added to the value of the lots that bordered them, and it is no coincidence that William McKnight built his own mansion here, overlooking the Thompson Triangle, which is the largest of these parks. Prior to the McKnight brothers’ development, the land north of Saint James Avenue and east of Thompson Street was owned by Colonel James M. Thompson. He was a businessman who served as president of several of Springfield’s banks, and he also held several political offices, including city alderman, state senator, and member of the Governor’s Council. After his death in 1884, the McKnights purchased and subdivided the property, in the process creating this park as its centerpiece. Many of the finest homes in the neighborhood are located on or around the Thompson Triangle, including the homes on Dartmouth Terrace, which can be seen in the distance in both photos. Today, the area around the Thompson Triangle remains one of the best-preserved parts of the neighborhood. William McKnight’s house still stands, as do the other 19th century mansions around the park, and in 1976 this area became part of the McKnight Historic District on the National Register of Historic Places. The only significant difference in these two photos is the fountain at the center of the triangle, which was added along with benches and brick walkways during a 1986 renovation of the park. 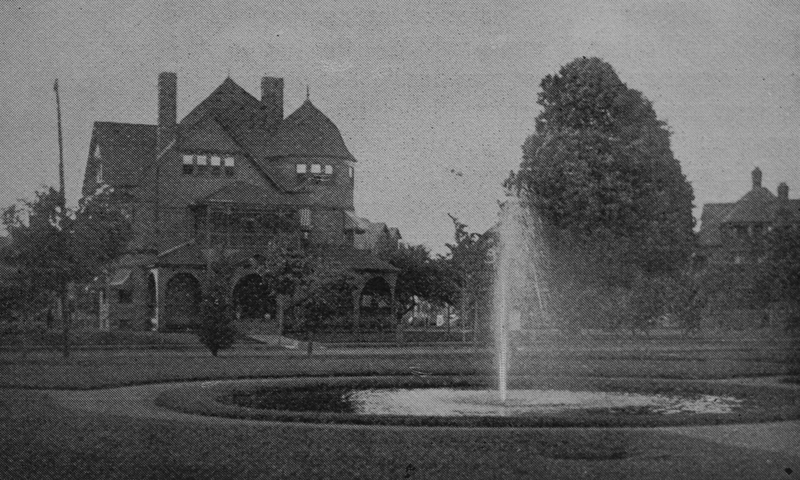 The Country Club of Pittsfield, on South Street, around 1900-1906. Image courtesy of the Library of Congress, Detroit Publishing Company Collection. The Country Club of Pittsfield was established on this site on South Street in 1900, but the building that became the clubhouse actually dates back more than a century earlier. It was built in 1785 by Henry Van Schaack, who lived here until 1807. During this time, he entertained visitors such as Alexander Hamilton, Chief Justice John Jay, and Senator Philip Schuyler. From 1816 to 1837, it was the home of author Herman Melville’s uncle, Thomas Melville.By this point, Pittsfield was becoming a popular destination for some of the great writers of the era, and Thomas’s son Robert took advantage of this. 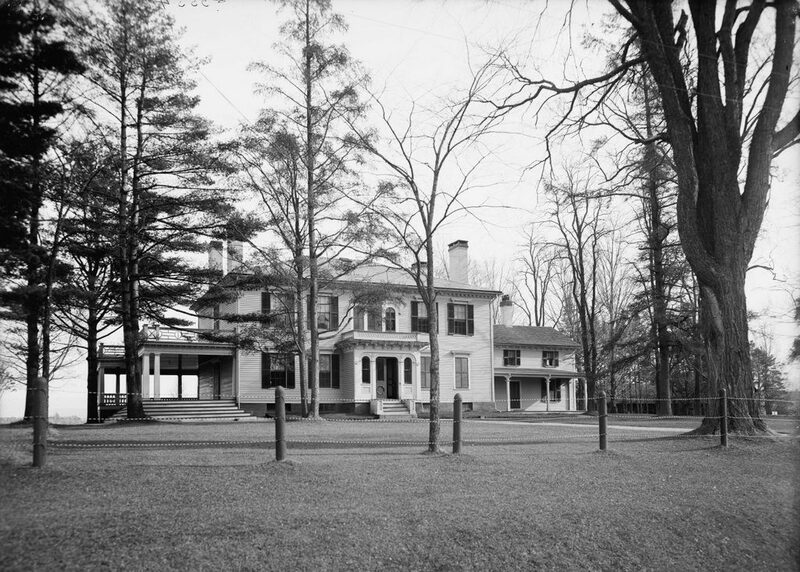 He purchased the house from his father in 1837 and opened Melville Hall, a resort whose guests included literary figures such as Herman Melville, Nathaniel Hawthorne, Oliver Wendell Holmes, and Henry Wadsworth Longfellow. In 1850, the house was sold to the Morewood family, who renamed it Broad Hall and lived here for the next 50 years. Prominent guests continued to visit here during this time, including former president John Tyler. After the Morewoods sold the property to the country club in 1900, the house very nearly hosted another president. Theodore Roosevelt was in Pittsfield on September 3, 1902, and was traveling in a horse-drawn carriage on South Street, heading for the country club. With him was governor Winthrop M. Crane, along with several others. Shortly before reaching the country club, the carriage was hit by a speeding trolley, throwing the occupants out of the carriage. Roosevelt suffered a bloody lip and bruised face, and was reportedly only two inches away from being crushed by the wheels of the trolley, but was otherwise unhurt, and later remarked that “It takes more than a trolley accident to knock me out.” However, Secret Service agent William Craig was killed in the accident, making him the first agent to be killed in the line of duty. Today, the country club is still located on this property, although the clubhouse has significantly expanded from its original 18th century building. The historic structure is still easily distinguished from the modern additions, though. 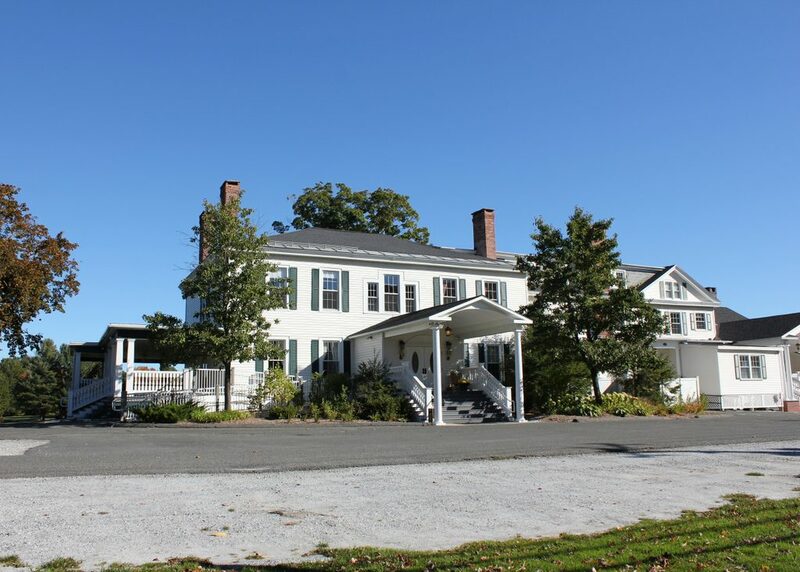 It still has its distinct Federal architecture, and aside from its connection to so many historic figures, it also serves as a rare example of an 18th century mansion in Pittsfield. The view looking east down East Street from Park Square in Pittsfield, around 1910-1920. Image courtesy of the Library of Congress, Detroit Publishing Company Collection. The first photo shows a quiet day in the center of Pittsfield. A couple of groundskeepers maintain Park Square, with the man in overalls on the right operating a push mower. Another man, barely visible in the distance beyond the sign, also appears to be pushing a lawnmower. At the end of the walkway in the center of the photo, a couple of boys play on an old cannon that probably dated back to the Civil War. The only other person visible in the scene is a woman in a black skirt, white blouse, and large hat who is crossing East Street on the far left. In the foreground, a sundial marks time in the center of Park Square, and to the left of it a sign commemorates the site of America’s first cattle show, which was held here in 1810. It also marks the spot of the “old elm,” which stood there until 1864. This tree towered over the center of Pittsfield since the town was settled in the 1750s. 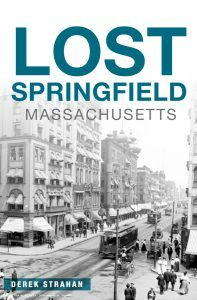 In fact, it was the center of Pittsfield – the surveyor who laid out the downtown area in 1752 used it as the center. It survived numerous proposals to remove it, and by the early 19th century it had become a major landmark, with Park Squre encircling it. In 1825, during his tour of the United States, the Marquis de Lafayette stopped here and gave a speech from under the tree. Later on, the iconic tree was mentioned in the writings of both Nathaniel Hawthorne and Herman Melville. However, by 1864 the ancient tree was in danger of falling, and with much reluctance it was taken down. 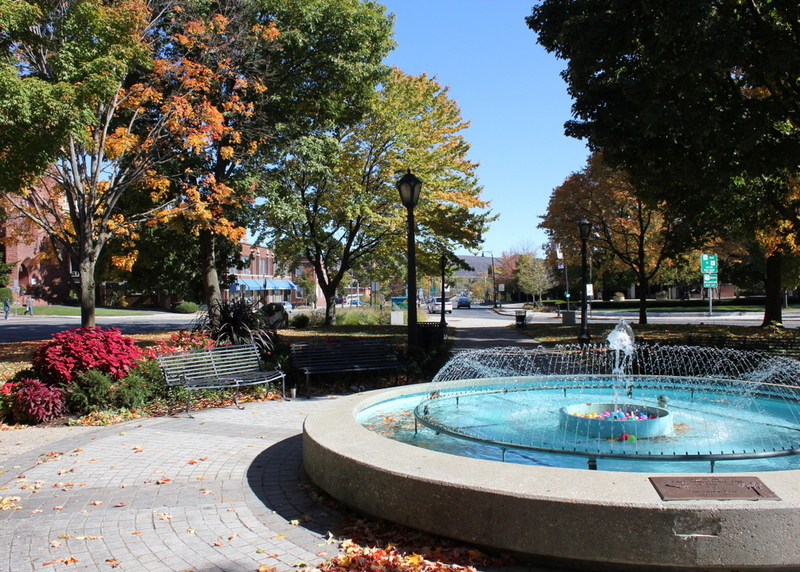 Today, Park Square is still the main focal point of downtown Pittsfield. East Street in the distance has changed somewhat over the past century, and is no longer a predominantly residential street. Most of the houses that would have been present in the distance of the first photo are gone, but many of the buildings around Park Square are still standing. These include the Berkshire County Courthouse, St. Stephen’s Church, the old town hall, the First Church, the Berkshire County Savings Bank, and the Berkshire Life Insurance Company. All of these historic buildings, along with Park Square itself, are part of the Park Square Historic District on the National Register of Historic Places.